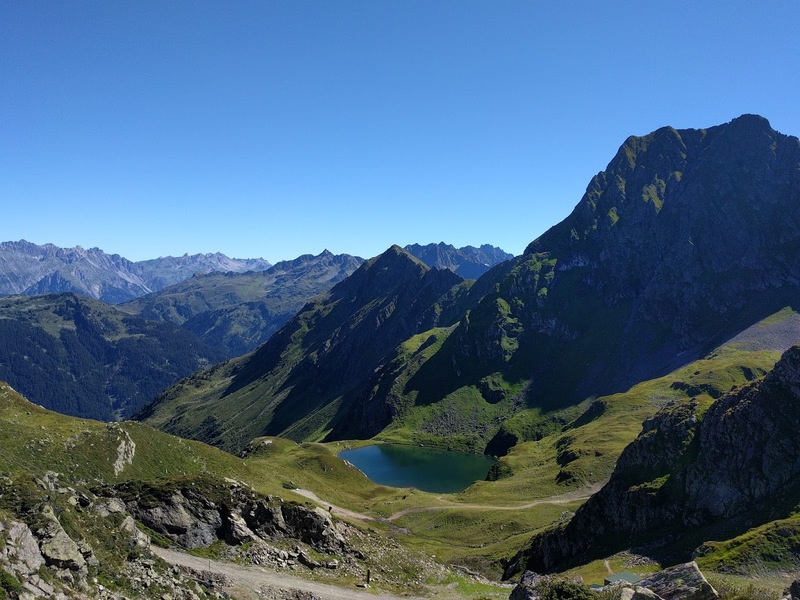 Last week, I had the opportunity to go hiking in the beautiful Montafon area. I had not been on a proper mountain hike for years and never been to Vorarlberg, the westernmost province of Austria, so was really happy I got to join this company outing, even though I was a bit of a gate-crasher, as not really part of the Sales team(s) whose offsite it was. Be that as it may, we all had a blast and the weather was perfect. Needless to say, there were plenty of mountain metaphors ("reaching the top", "rope team") mentioned to draw the analogy to work and it was somewhat shocking how - at the beginning at least - the majority of the participants seemed to saw this more as a race than an experience in the sense that they were running uphill that made others (including myself) long for a break, or even the opportunity to stop to admire the scenery and take a picture. I was really grateful when one of my office colleagues started the "break, please!" and it was reassuring to see that the intern in her twenties seemed way more out of breath than I was. Once the ice was broken, the super ambitious ones raced ahead and arrived at the chalet where wer had lunch an hour ahead of schedule and the rest continued the hike at their own pace and stopped to enjoy the beauty of the mountain range and blue skies whenever they felt like it. Deterred by the competitive vibe, some Austrians did not even join for the second, much longer, but less steep, leg of the hike, but I did as I don't know if I will ever be back in this part of Austria. Stopping to smell the roses, or take more phone snaps than anyone will have the patience to look at seems to be an "art" that does not come naturally to some. Ever since I cancelled my Glossybox subscription last year and stopped hoarding nail polish like there was no tomorrow or I was a centipede with way more nails to paint than I actually have, my stash of beauty products has gradually dwindled a bit since I have actually used up some stuff. This is not to say that I don't still get intrigued by new products or buy things upon recommendation of others. Case in point for the latter is my Babyliss "wonder brush" as I like to call it. I ordered it in April as I fancied a nice blow dry that I could do myself (not an easy feat with longer, thick hair) and remembered my favourite Bulgarian colleague raving about her Babyliss brush. It only took watching a YouTube tutorial to get the hang of it and I have been using it pretty much every time I wash my hair. I am so addicted to looking nice that I even take it abroad with me. 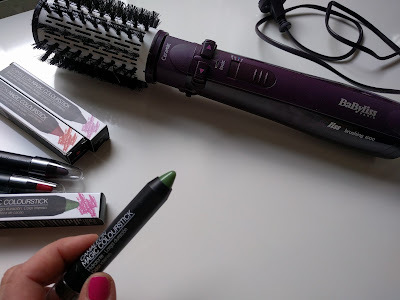 Definite recommendation if you are looking to tame your hair in 5 minute tops. The other amazing discovery is a lip crayon by Spanish brand Camaleon. It is caleld the Magic Colour Stick and I randomly picked it up at a pharmacy in Barcelona while waiting to pay for my (shockingly expensive, by the way) tampons. There were several colours available, but being me, I had to pick up the weirdest of them all, the green one. Since I never owned one of these mood rings as a kid, I am weirdly drawn to cosmetics that change their colour upon application. I did not have high expectations as a) it was pretty inexpensive and b) lipstick has a tendency to fade on me after 10 minutes max, even if marketed as "long lasting". Therefore I was in shock when I looked myself in the mirror hours (!) later and still found my lips a nice shade of pink that really suits my skin tone. Unfortunately, I had no opportunity to return to that pharmacy during my brief visit and ended up ordering a backup (plus the red and grey one) on a Spanish website with an outrageously high shipping fee. I love all the colours, so if you are in the market for a flattering long-lasting lipstick and happen to be in Spain, stumbling upon these: grab them! Last week I went to see the film "Toni Erdmann" with my mother upon her suggestion. I had bookmarked watching it at the back of my mind, but have to say was as suspicious of the hype around this film as I was repelled by the off-putting fake teeth and crazy wig of its male protagonist. I did not even know it was a whopping 162 (!) minutes long and had an espresso before leaving for the cinema performance at 8 p.m. just in case it turned out to be lengthy and boring. In the end, I was completely sucked in by this film and would not have minded watching 162 minutes more of it in the same sitting. My Mum, however, was yawning theatrically next to me and afterwards said that she could not remember the last time she had watched such long-winded BS. I could not believe it! Then I realised that it was a case of me being the perfect demographic or target group while she was not. The day after our cinema visit, I found out that a friend had seen it as well and said she had never cried so many tears of sadness and mirth at the same time in a film. I could not agree more. In case you are wondering just who I think IS the perfect target group for Toni E: anyone working in a big corporation and/or consulting, expat life or numerous business trips, as well as mild mildlife crisis optional. Go see it and report back to me please if you loved it or kept looking at the watch. As mentioned in my previous post, I was in Nice for (not quite) a week. As always, and despite the recent attacks, I had a great time and time flew by so incredibly fast. Despite a newcomer to the Gang this year, everyone enjoyed themselves and thanks to 4 separate sets of keys we could go our separate ways and reconvene at leisure. Mademoiselle (not pictured above) is the Gang Leader, if you so will, and none of us would have been bitten by the Nice bug if it were not for her being friends with the owner of the flats where we stayed. 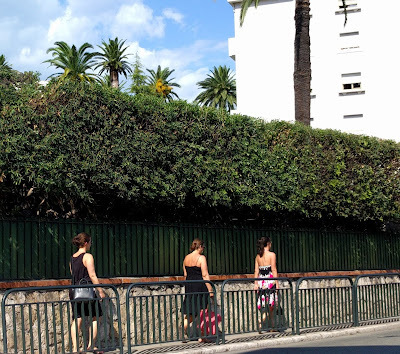 We studied together at university but were more acquaintances than friends until she asked me, prompted by Amica, whether I would consider a week in Nice with her. She would not have asked if she had not been "traumatised" by joint holidays with some complicated people the years before that. The rest is history. And perfect harmony. We all agreed that going away together really is the ultimate friendship test. You might be best friends since primary school or have worked together for decades but this does not mean that your favourite person won't get on your nerves by being bossy, sleeping 2 hours longer than you each morning, not ever chipping in to pay for groceries, or have interests diametrically opposed to yours. Thankfully, the Nice Gang consists of easy-going and tolerant people who are accommodating of each other's shopping addictions, food preferences and sleeping patterns. Looking forward to next year! Week 31: Ripe | Holidays! 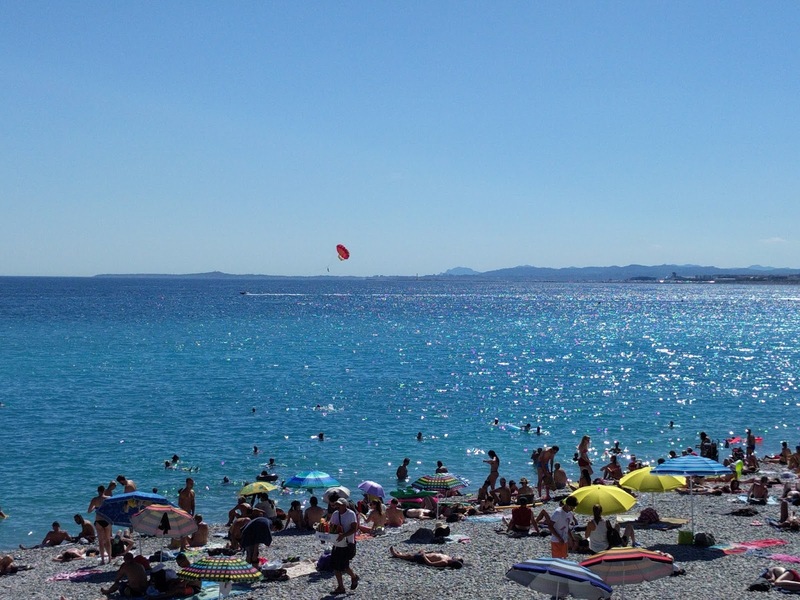 I am writing to you from Nice, where I am spending the first of two weeks of annual leave. 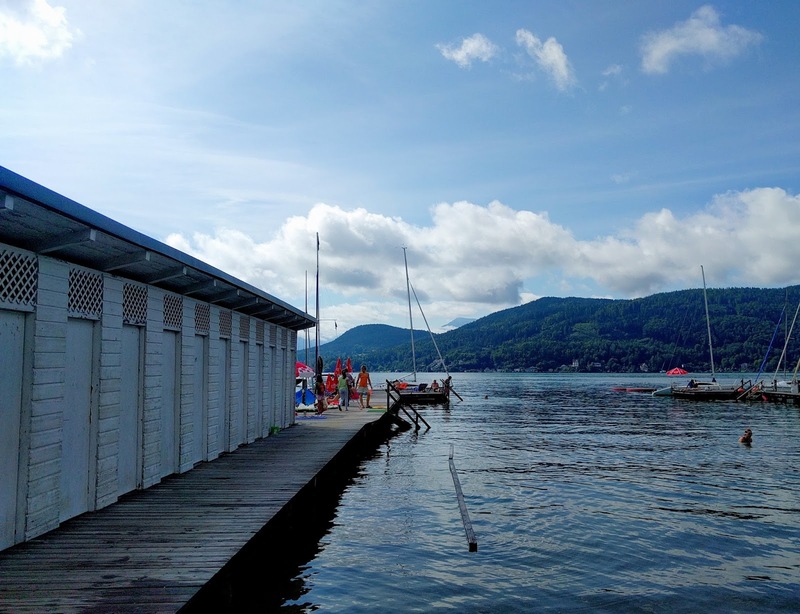 In German we have a really fitting adjective for someone who has been longing for a break and is more than deserving of it: urlaubsreif, literally ripe for a vacation . This is what I was feeling like and it is quite a novel sensation for me. While I am always looking forward to a break, I rarely ever get stressed by work. I do, however, get stressed by uncertainty and this is what I have had my fair share of these past months, so that I couldn't wait to leave *things* behind and switch off at my happy place that is Nice in summer. Despite the recent events, it has been like a breath of fresh air to come back. If you remember, I enjoyed 3 months of sweet summer nothingness last year. While it was not "life-changing" in any way, it certainly did confirm my suspicion knowledge that there are better things to do when it's >25° outside than sit in an office, be it air-conditioned or not. I won't lie, this summer I've been pitying myself a tiny bit for not having as much freedom. Then again, rare pleasures are all the sweeter and more valuable and so I try not to look back but to carve out as much enjoyment of THIS summer and seize the good weather as well as I can, such as by spontaneously hopping on a bus/train (I'd rather read than be stuck in traffic jams, sitting at the driver's seat) to Klagenfurt when the weather forecast is good. Week 34: Peak | Moving on Up Hello, we are an online shop (http://mariacommunion.com/ ) which sells communion dresses specially .After visiting your blog,we would like to collaborate with you. Could you please contact us at garmentvogue@mariacommunion.com so that we can reply you about the details if you are also interested in it ? Looking forward to your reply. Thank you very much.